You have an unfortunate typo. There's a comma after the www in the Prexury link. Commas aren't allowed. It must be a period. BTW, feel free to delete this comment after correcting. Here's something from their FAQ that seems significant. Staining is a big problems with some kitchen surfaces. They say that "all products in the Prexury range are stain-proof. To clean the surface, just use soap and warm water." Maybe those porous rock counters that end up causing such heartbreak could do with a quick micro fusing. To be quite honest, the carnelian counter that you chose makes me a bit queasy. It's busier than I can handle, but deeply fascinating if I glance and turn away. It seems like something you'd expect in a museum gift shop. Think I should I see someone about this? 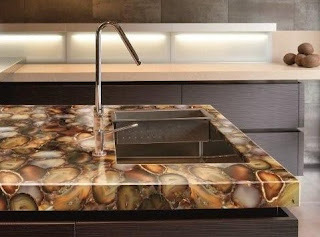 But I'm really taken by the "Retro Petrified" counter, maybe because it goes so unexpectedly well with flame orange. I'm surprised anyone had the courage to do such a kitchen. I have always loved orange. The carnelian makes me think of the photos of the planets taken with the Hubble telescope or the Cassini satellite. Personally, I am always wary of claims about material durability and care, no matter how reputable the source. Get a sample and test the heck out of it, I say. I appreciate the correction, and am sorry for the trouble it caused. An FYI to readers about the 'deleted post' note above: I mistakenly posted TGP's comments in the wrong thread. They appear in the 'Sustainable Shower' post. NOT an editorial gesture, simply mechanical.